Background: The combined positioning of the trunk and knee in the coronal and sagittal planes during non-contact anterior cruciate ligament (ACL) injury has not been previously reported. Hypothesis: During ACL injury female athletes demonstrate greater lateral trunk and knee abduction angles than ACL-injured male athletes and uninjured female athletes. Methods: Analyses of still captures from 23 coronal (10 female and 7 male ACL-injured players and 6 female controls) or 28 sagittal plane videos performing similar landing and cutting tasks. Significance was set at p⩽0.05. Results: Lateral trunk and knee abduction angles were higher in female compared to male athletes during ACL injury (p⩽0.05) and trended toward being greater than female controls (p = 0.16, 0.13, respectively). Female ACL-injured athletes showed less forward trunk lean than female controls (mean (SD) initial contact (IC): 1.6 (9.3)° vs 14.0 (7.3)°, p⩽0.01). Conclusion: Female athletes landed with greater lateral trunk motion and knee abduction during ACL injury than did male athletes or control females during similar landing and cutting tasks. Clinical relevance: Lateral trunk and knee abduction motion are important components of the ACL injury mechanism in female athletes as observed from video evidence of ACL injury. The purposes of the present study were to determine the trunk and knee position of female and male athletes at the time of ACL injury, and to compare these results with those of uninjured control athletes. The tested hypothesis was that compared with female control athletes and male subjects, injured female subjects would show greater lateral trunk angles and greater knee abduction angles at landing after a jump, pivoting or after a sharp deceleration manoeuvre. The video recordings were edited using Adobe Premiere Pro (V 2.0, Adobe Systems, San Jose, California, USA) and deinterlaced to achieve a 30-Hz (frames/s) effective frame rate via Abode Photoshop (V CS2, Adobe Systems).22 Initial contact (IC) with ground was analysed on each video. The trunk and joint kinematic measures were performed from the video sequences using ImageJ software (http://rsb.info.nih.gov/ij/). Joint angles were analysed in five sequential frames (stored as TIFF files) in sagittal or coronal planes, starting with initial ground-foot contact (time 0). Therefore, the time sequences observed were at approximately, initial contact of the foot with the floor and 50 ms, 100 ms, 150 ms and 200 ms post contact. ImageJ was used to measure joint angles after drawing lines based on the landmarks described below.25 26 All measurements were performed by the same author for consistency. Still image of a female anterior cruciate ligament (ACL)-injured subject during injury (front player, no. 22) relative to a control player (behind her), demonstrating the association between lateral trunk motion and medial knee collapse in the injured subject, but not the control player (obscured view, not analysed). This is frame 1 (initial foot contact with ground) of the subject (no. 22) landing and shows the calculated angles and the combined lateral trunk motion and knee abduction. Figure 1 shows an ACL-injured subject demonstrating combined lateral trunk motion and knee abduction during ACL injury. The mean lateral trunk angle relative to the vertical was higher in female athletes during ACL injury than in male players during ACL injury (p = 0.02; fig 2) and trended toward being greater than female controls (p = 0.16) performing similar landing and cutting tasks across the five repeated measures frames assessed, or approximately 200 ms of landing (fig 3). 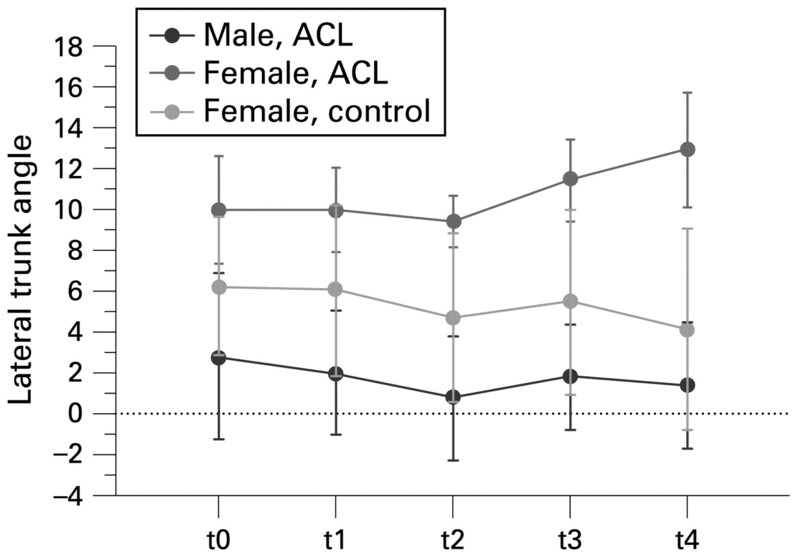 These differences were significant between female and male ACL-injured subjects at IC (mean (SD) 11.1 (2)° vs −5.5 (9.5)°, p = 0.04) and trended toward being greater than female controls performing similar landing and cutting tasks (IC: 11.1 (1.2)° vs 4.2 (9.6)°, p = 0.29). The mean anterior–posterior trunk angle relative to vertical was not different in female athletes during ACL injury than in males (IC: 1.6 (9.3)° vs −6.7 (8.6)°, p = 0.20). In addition, female ACL-injured athletes demonstrated less forward trunk lean than female controls (IC: 1.6 (9.3)° vs 14.0 (7.3)°, p = 0.005). 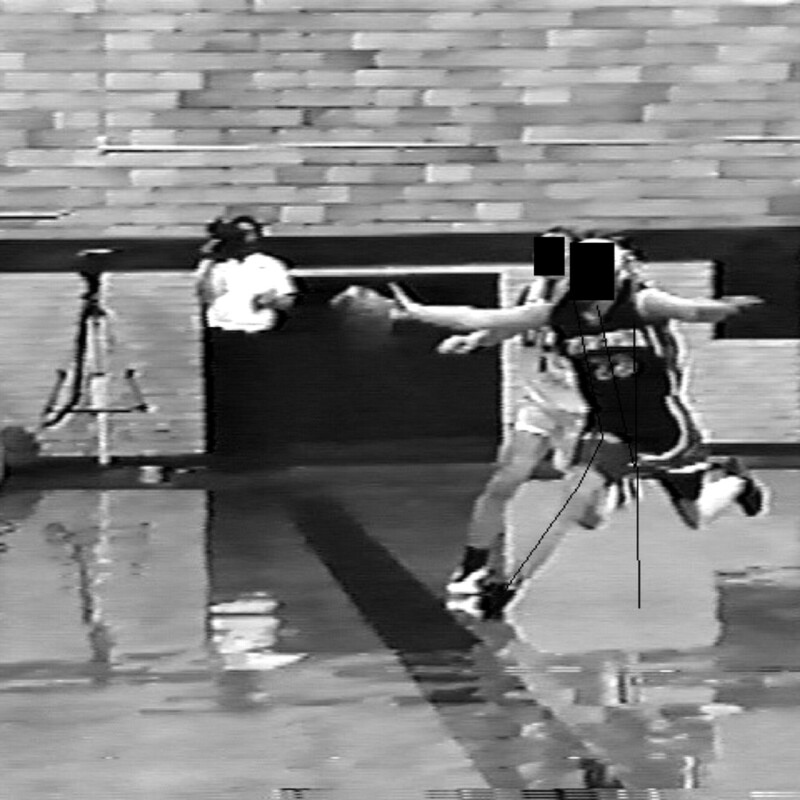 Still image with coronal angles a male subject demonstrating the absence of an association between lateral trunk motion and medial knee collapse during anterior cruciate ligament (ACL) injury. Coronal plane trunk angles (mean (standard error of the mean (SEM))) in female and male anterior cruciate ligament (ACL)-injured subjects and female controls. Coronal plane knee abduction angles (mean (standard error of the mean (SEM))) in female and male anterior cruciate ligament (ACL)-injured subjects and female controls. Movement biomechanics and lower extremity strength can be altered in females with neuromuscular training.45 Neuromuscular power can increase within 6 weeks of training and may result in decreases in peak impact forces and knee abduction moments.45–48 Observed changes in females may be greater than in males as their baseline neuromuscular performance levels are lower.49 If neuromuscular training can decrease ACL injury risk, it is likely that the mechanisms underlying increased risk are neuromuscular in nature.50 ACL injury risk may be reduced in trained females during landing and cutting.51 Elite female athletes show reductions in ACL injuries with neuromuscular training.52 These prospective studies indicate that neuromuscular training has the potential to decrease ACL injury rates in females. Neuromuscular control of the trunk and lower extremity can be improved with neuromuscular training,12 45 47 53 54 which may increase coronal plane trunk and hip control in females.45 49 55 For example, during a drop-jump, a two-footed plyometric activity, post training results showed that lower extremity valgus was reduced at the hip. Conversely, during a single-leg landing task, the most significant modifications may occur at the knee.47 Therefore, the effects of training in the coronal plane are likely to be movement task specific.47 Increased coronal plane control at the hip and trunk may be necessary to reduce ACL injury risk.56–58 lower extremity coronal joint motions and torques linked to increased ACL injury risk are often correlated, indicating that control of knee load may require synergistic and antagonistic contribution from the trunk, hip and knee.12 Perturbation-enhanced training may increase trunk control and decrease knee abduction load in females. The current video evidence of ACL injuries shows that the female trunk usually moves lateral to the ACL-injured limb as the knee abducts (fig 1 and Supplementary material), while this is not a common observation in males (fig 2). Trunk position and knee load may be mechanically linked, as lateral positioning of the trunk can create abduction loads at the knee.28 In the coronal plane, applying static equilibrium mechanics and neglecting the inertia of the body segments between hip and ground, if the GRF passes lateral to the centre of the head of the femur, an external hip abduction torque results.28 60 Interestingly, even alteration of arm position relative to the centreline of the body can increase the external knee abduction load by 29% to 60%.56 At the low knee flexion angles that are present during ACL injuries, the ACL, rather than the MCL, can be the primary restraint to knee abduction loads.56 61 62 Knee abduction load and ACL injury may be outcomes that result from an unstable, collapsing lower extremity column under axial load, caused by the GRF passing through the lateral knee compartment. 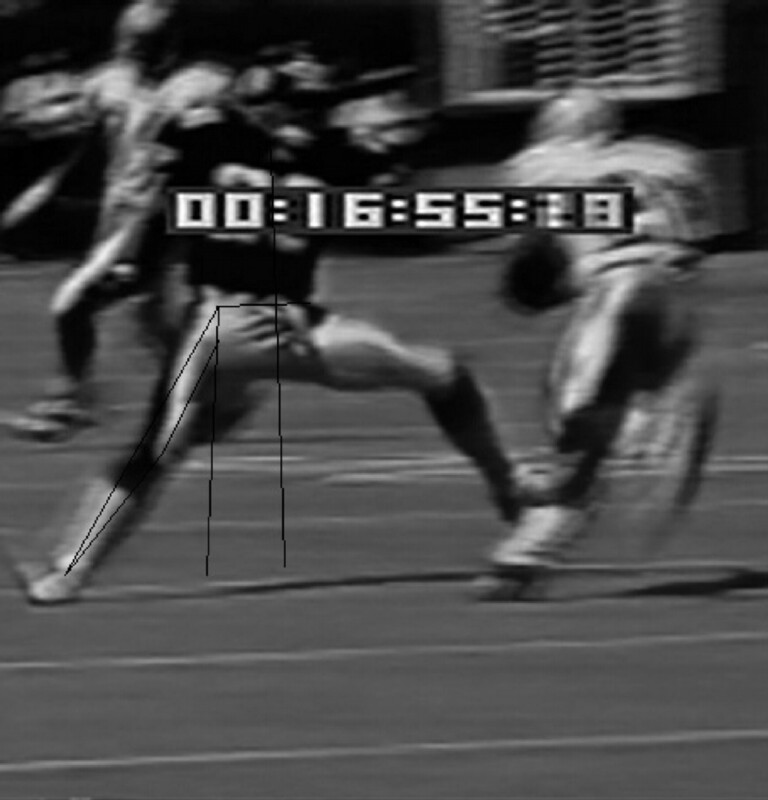 Previous studies of ACL injuries based on videotape analysis have relied on visual inspection to determine joint positions.19 70 71 Visual inspection has poor accuracy and precision for joint angle measurement.72 In a study assessing the accuracy of the visual inspection technique, the mean error for knee flexion was 19 degrees, while the standard deviation between the observers for hip flexion was 18 degrees on average.72 We used a digital measuring tool to define joint position more accurately and more quantitative. Increased hip abductor muscle recruitment and strength likely has a direct effect on the knee abduction loading of the ACL during cutting and landing. Though ACL injuries likely occur too quickly (likely under 100 ms) for reflexive muscular activation (greater than 100 ms), athletes can adopt preparatory muscle recruitment and movement patterns that reduce the probability of injuries caused by unexpected perturbations.24 73 74 We hypothesise that decreased neuromuscular control of the trunk leads to increased joint load (knee abduction moment) via lateral motion of the GRF and results in increased ACL injury risk in female athletes (figs 1 and 3). In addition, the sagittal trunk observations were that the injured female subjects had less trunk flexion than female controls. This may place their trunk in line with the leg to increase valgus and/or the axial forces. However, decreased flexion at trunk did not appear to alter flexion at other lower extremity joints.
. Secondary school athletic injury in boys and girls: a three-year comparison. Phys Sportsmed 1985;13:106–11.
. Injury risk in professional basketball players: a comparison of Women’s National Basketball Association and National Basketball Association athletes. Am J Sports Med 2006;34:1077–83.
. Relationship of gender to anterior cruciate ligament injuries in intercollegiate basketball players. J South Orthop Assoc 1993;2:36–9. NCAA. NCAA injury surveillance system summary. Indianapolis, Indiana, USA: National Collegiate Athletic Association, 2002.
. A comparison of men’s and women’s professional basketball injuries. Am J Sports Med 1982;10:297–9.
. Anterior cruciate ligament injuries in the female athlete. J Gend Specif Med 2001;4:25–34.
. Rationale and clinical techniques for anterior cruciate ligament injury prevention among female athletes. J Athl Train 2004;39:352–64.
. Finite element analysis of human knee joint in varus-valgus. Clin Biomech (Bristol, Avon) 1997;12:139–48.
. Deficits in neuromuscular control of the trunk predict knee injury risk: a prospective biomechanical-epidemiological study. Am J Sports Med 2007;35:1123–5.
. Mechanisms of anterior cruciate ligament injury in basketball: video analysis of 39 cases. Am J Sports Med 2007 Mar;35:359–67.
. The Henning program. In: Griffin L Y, ed. Prevention of noncontact ACL injuries. Vol 1. Rosemont, Illinois, USA: American Academy of Orthopaedic Surgeons, 2001:93–96.
. The female ACL: why is it more prone to injury? Orthop Clin North Am 2002;33:637–51.
. Video analysis of anterior cruciate ligament injury: abnormalities in hip and ankle kinematics. Am J Sports Med 2009;37:252–9.
. In vivo knee stability: a quantitative assessment using an instrumented clinical testing apparatus. J Bone Joint Surg 1978;60A:664–74.
. The role of the musculature in injuries to the medial collateral ligament. J Bone Joint Surg 1979;61-A:398–402.
. Imaging processing with ImageJ. Biophotonics Int 2004;11:36–42.
. Image porcessing and anlaysis. Bethesda, Maryland, USA: US National Institutes of Health, 2007.
. Control of whole body balance in the frontal plane during human walking. J Biomech 1993;26:633–44.
. Biomechanics and motor control of human movement. 3rd edn. New York, USA: John Wiley & Sons, 2005.
. Trunk muscle coactivation in preparation for sudden load. J Electromyogr Kinesiol 2001;11:247–54.
. Gender differences in hip adduction motion and torque during a single leg agility maneuver. J Orthop Res 2006;24:416–21.
. Development and validation of a 3-d model to predict knee joint loading during dynamic movement. J Biol Chem 2003;125:864–74.
. Influence of gender on hip and knee mechanics during a randomly cued cutting maneuver. Clin Biomech 2004;19:1022–31.
. Gait analysis: normal and pathological function. Thorofare, New Jersey, USA: SLACK, 1992.
. Strategies for enhancing proprioception and neuromuscular control of the knee. Clin Orthop 2002;402:76–94.
. Differences in normal and perturbed walking kinematics between male and female athletes. Clin Biomech 2004;19:465–72.
. A gender-related difference in the contribution of the knee musculature to sagittal-plane shear stiffness in subjects with similar knee laxity. J Bone Joint Surg Am 2002;84-A:10–16.
. 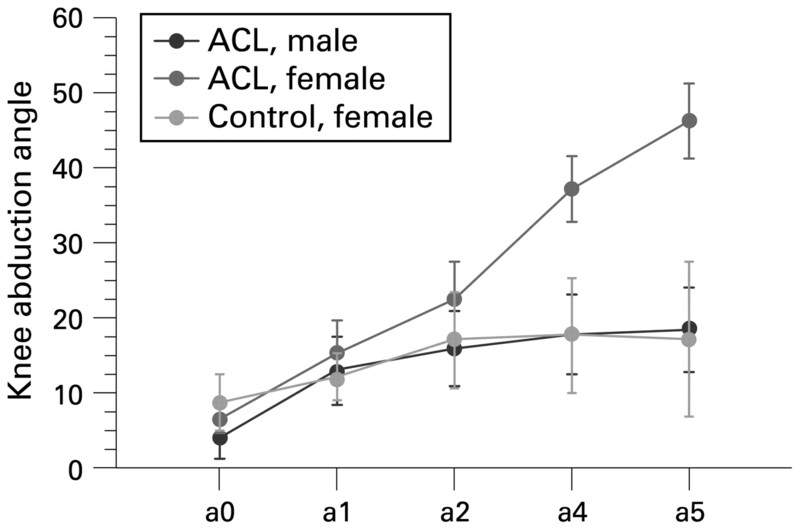 Gender differences in muscular protection of the knee in torsion in size-matched athletes. J Bone Joint Surg Am 2003;85-A:782–9.
. Human balancing of an inverted pendulum: is sway size controlled by ankle impedance? J Physiol 2001;532:879–91.
. Human balancing of an inverted pendulum: position control by small, ballistic-like, throw and catch movements. J Physiol 2002;540:1111–24.
. Kinaesthetic signals and muscle contraction. Trends Neurosci 1992;15:62–5.
. Ankle inversion injury and hypermobility: effect on hip and ankle muscle electromyography onset latency. Arch Phys Med Rehabil 1995;76:1138–43.
. A prospective, randomized clinical investigation of the treatment of first-time ankle sprains. Am J Sports Med 2006;34:1401–12.
. Predictors of sprint start speed: the effects of resistive ground based vs inclined treadmill training. J Strength Cond Res 2007;21:491–6.
. Effect of resistance training on women’s strength/power and occupational performances. Med Sci Sports Exerc 2001;33:1011–25.
. The female athlete’s knee. Clin Sports Med 1985;4:345–66.
. Neuromuscular performance characteristics in elite female athletes. Am J Sports Med 1996;24:427–36.
. Postural control in single-limb stance. J Orthop Res 1988;6:833–9.
. The mechanical consequences of dynamic frontal limb alignment for non-contact ACL injury. J Biomech 2006;39:330–8.
. Sagittal plane biomechanics cannot injure the ACL during sidestep cutting. Clin Biomech 2004;19:828–38.
. Predictors of knee valgus angle during a jump-landing task. Med Sci Sports Exerc 2005;37:S398.
. Perturbation-enhanced neuromuscular training alters muscle activity in female athletes. Knee Surg Sports Traumatol Arthrosc 2006;14:60–9.
. A new parametric approach for modeling hip forces during gait. J Biomech 2003;36:113–19.
. Musculoskeletal dynamics, locomotion, and clinical applications. In: Mow V C, Hayes W C, eds. Basic orthopaedic biomechanics, 2nd edn. Philadelphia, Pennsylvania, USA: Lippincott-Raven, 1997:37–68.
. ISB recommendation on definitions of joint coordinate system of various joints for the reporting of human joint motion—part I: ankle, hip, and spine. International Society of Biomechanics. J Biomech 2002;35:543–8.
. Gender differences in the kinematics of unanticipated cutting in young athletes. Med Sci Sports 2005;37:124–9.
. Effect of gender and defensive opponent on the biomechanics of sidestep cutting. Med Sci Sports Exerc 2004;36:1008–16.
. A comparison of dynamic coronal plane excursion between matched male and female athletes when performing single leg landings. Clin Biomech (Bristol, Avon) 2006;21:33–40.
. A dynamical systems investigation of lower extremity coordination during running over obstacles. Clin Biomech (Bristol, Avon) 2001;16:213–21.
. Mechanism of the pivot shift. J Bone Joint Surg 1990;72:816–21.
. Video analysis of ACL injuries. In: Griffin L Y, ed. Prevention of noncontact ACL injuries. Vol 1. Rosemont, Illinois, USA: American Academy of Orthopaedic Surgeons, 2001:87–92.
. Estimating 3D joint kinematics from video sequences of running and cutting maneuvers—assessing the accuracy of simple visual inspection. Gait Posture 2007;26:378–85.
. Effect of verbal instructions on muscle activity and risk of injury to the anterior cruciate ligament during landing. Br J Sports Med 2003;37:1–11.
. Dynamic elongation behavior in the medial collateral and anterior cruciate ligaments during lateral impact loading. J Orthop Res 1993;11:190–8.
. A model-based image-matching technique for three-dimensional reconstruction of human motion from uncalibrated video sequences. J Biomech 2005;38:919–29. Funding: This work was supported in part by NIH/NIAMS grants R01 AR049735, R01 AR05563 and R01 AR056259 (TEH).